Perfectly suited for every quilt project. 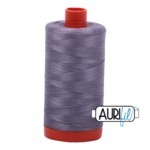 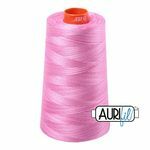 Aurifil Thread, from Milan Italy, started out as cotton machine embroidery thread, but quilters quickly discovered that Aurifil Mako Cotton Thread was ideal for piecing and quilting. Coming to the US from Italy in 2007, Aurifil has quickly become the gold standard in 100% long staple Egyptian cotton quilting thread. Offering 12wt, 28wt, 40wt, 50wt and 80wt, Aurifil offers both professional and home quilters the perfect thread color and type regardless of your need. Aurifil's Eqyptian cotton is grown in the MAKO region of Egypt, on the river Nile. The production process is based in Milan, where the thread undergoes 15 stringent steps before it becomes a ready for use spool. 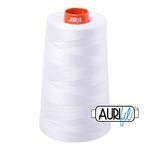 Aurifil’s 50wt thread is our most versatile and most popular Cotton thread and is wound on our iconic orange spool. The 50wt is strong and thin, and results in remarkably flat and crisp seams. While it is wonderful for piecing, subtle quilting & topstitching, and English Paper Piecing it also works incredibly well for Needle Turn Applique, Bobbin and Machine Lace, Machine Applique (Straight Stitch, ZigZag, Blind Hem and Blanket Stitch,) Machine Embroidery, Dense Machine Quilting, Subtle Machine and Longarm Quilting, Basting, Whole Cloth and Micro Quilting, and Dense Background Designs.